When you are planning commercial cleaning for your office space, it’s easy to overlook door cleaning. Your janitorial team would be regularly wiping down the doorknobs as a part of their cleaning job. 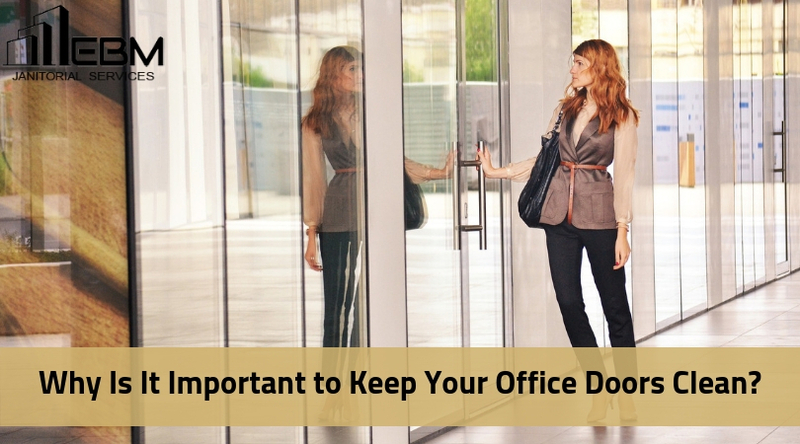 Is it enough to keep your office doors clean? Doors are the most touched items in a commercial facility, whether it’s your office, showroom, or warehouse. Whenever someone goes in or out of the office, or other rooms like a restroom, conference room, file room, cafeteria, break room or copy room, the person touches the door. As a result, it gets dirty and attracts a lot of germs. Since commercial places are high-traffic areas, they are highly prone to attracting bacteria and viruses. Doors and door handles are a common place for these bacteria and viruses to collect and spread in your office. An improperly cleaned office door has dirt and fingerprints which will make a poor first impression on your customer or clients. While it is true that dark colored doors do not show signs of dirt or fingerprints, they are as dirtier as any other light colored or transparent door. When you hire a commercial cleaning company to perform regular cleaning and janitorial services, it is important to include door cleaning as a priority task in your office cleaning process. It doesn’t require much effort and resources to clean office doors. You simply need a microfiber cloth and disinfectant cleaner. Spray the disinfectant solution on the dirty door and wipe it with the microfiber cloth. For tough spots that are very dirty and don’t come out easily, you can use a soft pad or brush. However, never apply force as it can affect the door paint. Other areas like doorknobs and the top edge of the door frame need to be cleaned as well. To eliminate the hassle of cleaning doors and avoiding the risks, rely on commercial cleaning services. Perfect door cleaning can be achieved by hiring a professional office cleaning company which has a fully-trained janitorial staff to look after every aspect of your commercial cleaning needs, including the doors. They ensure that your workplace is clean and healthy to offer a productive work environment.